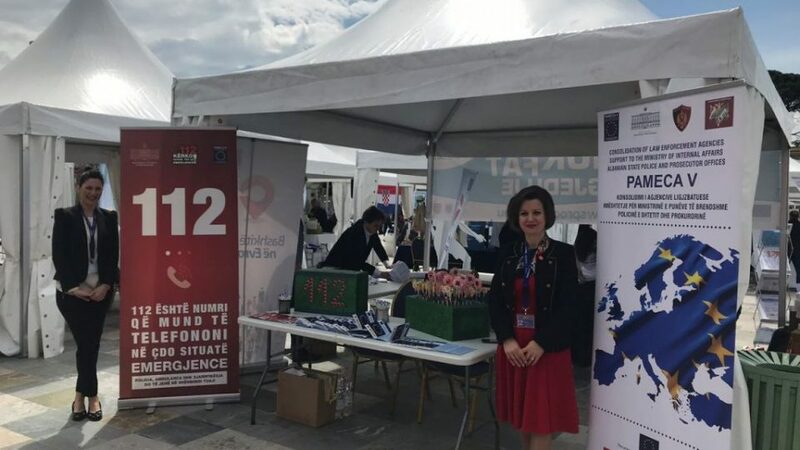 PAMECA V Project joined the ‘EU Village’ Event in Skanderbeg Square, held jointly by The European Union Delegation to Albania with the Tirana Municipality, as part of the week of festivities on the occasion of Europe Day, which celebrates peace and unity of people in Europe every year on May 9th. PAMECA V – 112 Corner was organized in order to raise awareness to the general public and particularly among the youth and children, on the use of the unified 1-1-2 number in cases of emergency. Promotion materials were distributed to the participating members of the public, and the 1-1-2 mobile emergency centre was also displayed, and visitors were welcomed to see the interior equipment in simulated action.